These heavy-duty vinyl stair treads with grit strips have raised horizontal ribs and two strips of anti-slip tape that provide increased traction. The corrugated rib construction allows dirt and moisture to fall between while helping keep traction on top. 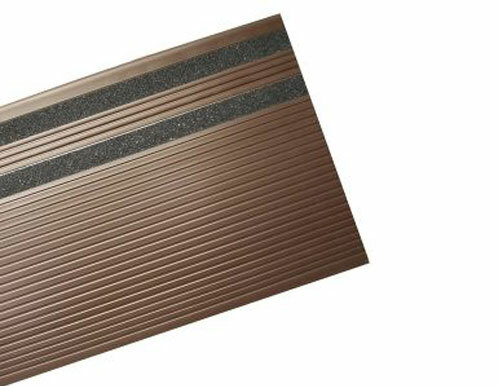 Grit strip vinyl stair treads are designed to modernize and restore all types of stairways while providing excellent anti-slip protection, especially in wet conditions. These vinyl stair tread covers are ideal for heavy-duty residential, commercial and industrial use. Typical installations include hotels, office buildings, condominiums, schools, theaters, and churches.